A conversation with Richa Singh, Surbala Vaish and Richa Nagar, three of the nine authors of Playing with Fire (PWF). PWF emerged from close dialogue among eight NGO activists in Uttar Pradesh, India, and a professor and writer based primarily in the US. 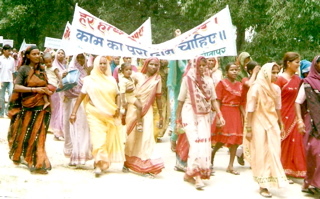 PWF interweaves stories about the lives of seven village-level NGO activists, beginning with their collective analysis of poverty, casteism, and communal untouchability in childhood; the abuses that frequently accompanied their marriages; to their triumphs as NGO workers; to a critique of this NGO and, more generally, of donor-driven empowerment. The book was first published as "Sangtin Yatra" in Hindi in India in 2004, and has subsequently spawned a social movement in the Sitapur District of Uttar Pradesh.